Week 24 in the Premier League season comes with a set of midweek matches following a weekend of FA Cup football with round four taking place Friday through Sunday. Several Premier League teams will be taking part in the weekend set of matches including Everton, Liverpool, Man City, and Stoke City following their midweek Capital One Cup fixtures. What this means for each of these clubs going into week 24 is hard to say at this point, but it doesn’t give them a whole lot of time to rest. With Leicester City continuing their high flying season at the top of the league, they can continue to heap the pressure on their title rivals Arsenal and Man City. Meanwhile Tottenham are hoping to strengthen their Champions League position with a visit to Norwich City. Manchester United are continuing to falter and have both West Ham and Liverpool picking up points right on their heels. The bottom of the table could have a shakeup depending on how results go, but it’s hard to see either Sunderland or Aston Villa having any change in their positions. If you are looking for some good fantasy Premier League matchups there are few decent stacks, especially if you are looking for offensive points. In this FPL season it has been difficult to chase clean sheets, so you’re better off seeking some offense whenever possible. Manchester City: facing Sunderland, even on the road, has been a recipe for goals for most teams, but especially for Sergio Aguero. Tottenham Hotspur: Top of the form table and playing a Norwich team that has lost three matches in a row; looking good for Spurs. West Ham United: Playing at home against Aston Villa is always a good sign for any team this season, but especially for the Hammers at this point. West Ham has scored two goals in each of their last three home games, including one clean sheet and a 2-2 draw against Man City. 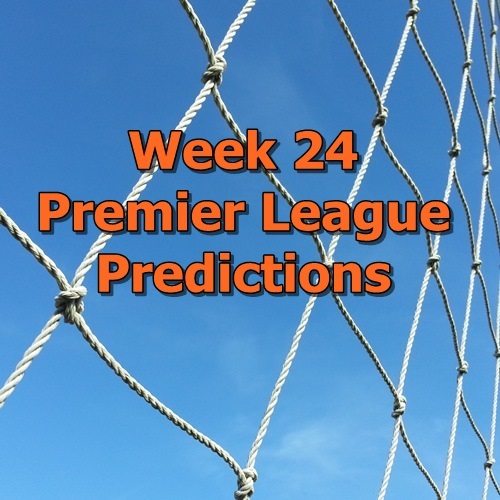 That wraps up the week 24 Premier League predictions. Hopefully some of these FPL matchups can aid your fantasy football team for another week of matches. Good luck and have fun!